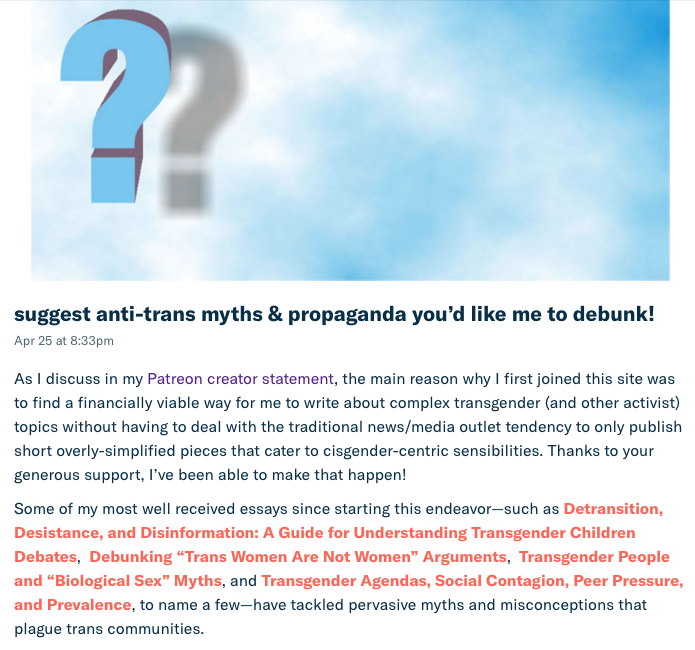 May 2018 update: upcoming events, recent & future writings, & new videos! 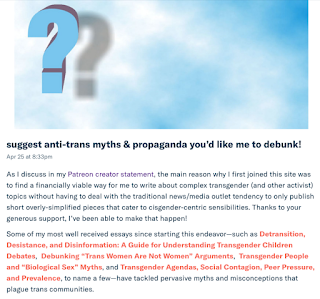 my recent Patreon post: Suggest anti-trans myths & propaganda you’d like me to debunk! other recent pieces about "autogynephilia" and "identity politics"
May 16, 2018 -- I will be giving a keynote entitled “Queer Communities and Future Possibilities” at University of Washington, Tacoma Pride, at 1pm at William Phillip Hall. More details can be found here. May 24, 2018 -- I will be interviewed live at the California Institute of Integral Studies event: “A Conversation with Julia Serano and Zara Zimbardo: On Trans Feminism.” The event will be at CIIS, 1453 Mission Street, San Francisco, CA, at 7pm. Tickets are $15 in advance, $20 at the door; more event details can be found here and here. May 28, 2018 -- I will be reading some of my new fiction at Yarn: Comedy Storytelling. Other featured performers include Heather Gold, Gina Gold, and Aundré the Wonderwoman. The show is at Shotgun Players (1901 Ashby Ave, Berkeley, CA), doors at 7pm, show at 7:30pm. Ticket info (including reduced-price advanced tickets!) can be found here. June 9, 2018 -- my solo music project *soft vowel sounds* will be playing a benefit for LYRIC Center for LGBTQQ Youth. The event will be held at Laughing Monk Brewing (1439 Egbert Ave, Unit A, San Francisco, CA) who will be donating a portion of the evening's sales to the cause. The other acts include Polythene Pam and Mya Byrne. More details here. You can read the full update here. If you want to receive my email updates directly to your inbox, you can sign up here.